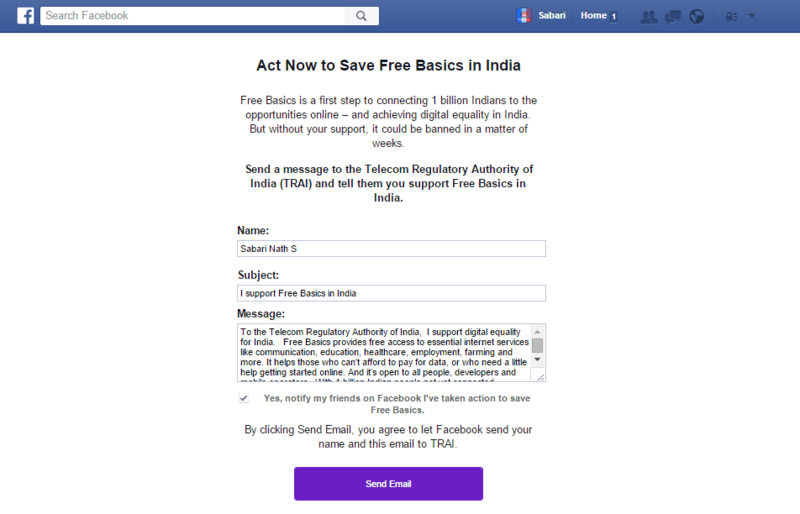 Facebook has launched a new campaign on its site asking India users to save Free Basics platform by signing an email to TRAI. Free Basics was formerly known as the Internet.org but has faced criticism in India as many argue that it is in violation of Net Neutrality principles. Why Save Free Basics Campaign? The letter is written in response to TRAI’s recent paper which questions whether zero-rating plans and apps could be in violation of regulatory and anti-discriminatory principles. It should be noted that the TRAI paper does not mention Net Neutrality as such. Clearly free is the most exciting word we can hear of. It excites us, and we look forward to free around any deal we may get. So essentially, what is it with Facebook that it has managed to put off so many people and get them to vociferously oppose its Free Basic package. It’s interesting how the debate to net neutrality began with activists setting up a website (savetheinternet.in). And now Facebook is taking the same route, but countering the Net Neutrality camp by influencing its user base to send emails to Trai that renders their support for Free Basics in India. Most people agree that the campaign is in response to a TRAI consultation paper, which it put out earlier this month, and is looks at the issue of differential pricing. The user clicking on the Send Email button is showing support for Digital Equality, which is a good term for free as in free of charge. But that free, hinders the basic aspect of freedom, of choice, that many more want to defend with all might! Facebook currently has over 130 million monthly active users in India at present. Free Basics aims to provide free access to basic Internet services by partnering with telecom companies. Such practices, commonly referred to as “zero-rating”, allows users to access select applications or websites, free of data charges, by striking deals with telecom operators. And also Google came out with new plan, launching Project Loon to deliver affordable internet to millions of Indians. So what do you think about Save Free Basics campaign? Do you support or oppose Facebook’s new campaign? We’d love to hear from you in the comments!